It has been over a year since Decorfolia moved onto the nursery here in Sway. Last summer saw a flurry of work being done, we had an LPG tank installed for the glasshouse and office heating, full insulation, electricity and lighting installed into the greenhouses, plus our state of the art composting toilet... When the Christmas rush was over we all sat back and discussed what we should do for the next project. 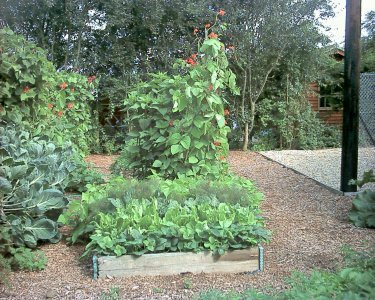 It was agreed that perhaps small beds where we could all grow our own vegetables might be a good idea. In the meantime I had started collecting the cardboard tubes from WC rolls, kitchen rolls and wrapping paper, and using them to plant a variety of seeds - to start with it was broad beans, followed by runner beans and dwarf french beans, then courgettes, pumpkins and even aubergines. This is a tip I picked up from one of the TV gardening programmes. The larger seeds germinate in the tubes and then you can plant them out into the ground, tube and all, without disturbing the root systems, next year I am going to try using the gutter pipe method to grow seeds...watch this space! We filled one of the beds with rhubarb, a number of crowns were already growing here, perhaps our predecessor had used the neighbour's horse manure for something! Then the other beds were planted with a selection of seasonal veg and salad, Kate has also planted some Jerusalem artichokes and strawberries. 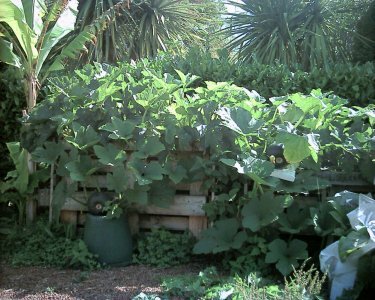 The pumpkin crop looks spectacular - just 4 plants growing on our compost bins - now we need recipes for soup, pumpkin pie and anything else you might like to suggest! Who would have thought that an area that last year was covered in spindly fir trees would this year be so productive and a source of fresh food for us all. Who says being "at the office" is boring!